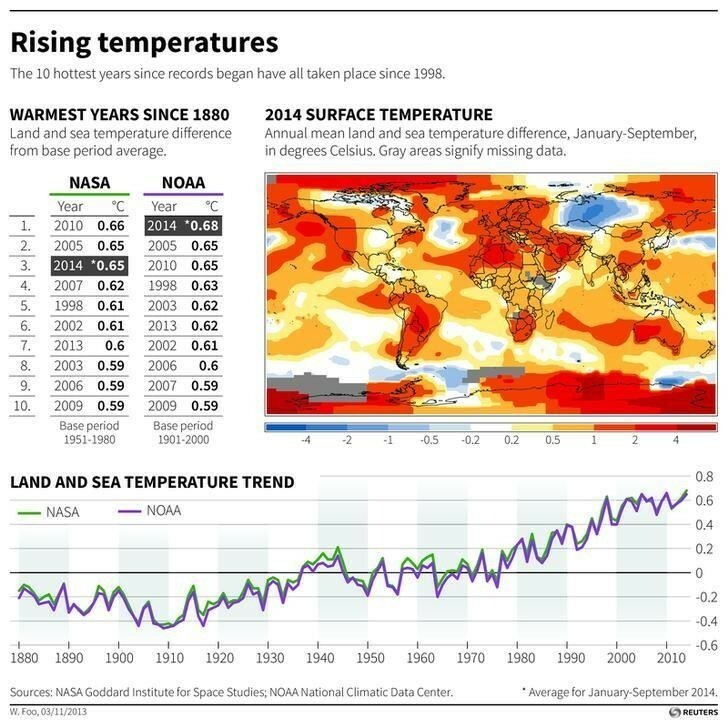 Scooper - Technology News: Are climate targets enough to keep global warming below 2°C? Are climate targets enough to keep global warming below 2°C? At the United Nations in New York on April 22, world leaders ratified the global climate agreement reached in Paris last December. One hundred ninety-five countries, ranging from richest to poorest, have now agreed to limit global warming to well below 2°C above pre-industrial levels, with the goal of not exceeding 1.5°C. They have also committed to “intended nationally determined contributions” (INDCs) to limit or reduce greenhouse-gas emissions by 2030. This is a major achievement, but it is far from sufficient. In fact, even if all INDC targets were achieved, the world would still be heading toward eventual warming of some 2.7-3.4°C above pre-industrial levels . To keep warming well below 2°C, emissions in 2030 must be more than 30% below those envisaged in the INDCs. This will be an enormous challenge, given the need for major strides in economic development over the same period. Before this century is over, we should seek to enable all the world’s people – probably more than ten billion by then – to achieve the standards of living currently enjoyed only by the wealthiest 10%. That will require a huge increase in energy consumption. The average African, for example, today uses about one-tenth of the energy used by the average European. But by 2050, we must reduce energy-related emissions by 70% from 2010 levels, with further cuts needed to achieve net zero emissions by 2060. Meeting those objectives will require both an improvement in energy productivity (the amount of income produced per unit of energy consumed) of at least 3% per year and the rapid decarbonization of energy supply, with the share of zero-carbon energy increasing by at least one percentage point each year. This implies a massive acceleration of national efforts. Over the last decade, energy productivity has grown by only 0.7% annually, and the share of zero-carbon energy rose by only 0.1 percentage point per year. Moreover, even if the INDCs were fully implemented, these annual growth rates would reach only 1.8% and 0.4 percentage points, respectively. Impressive progress is already being made in one crucial area: electricity generation. Solar power costs have fallen 80% since 2008. In some places, new supply contracts have set prices as low as $0.06 per kilowatt hour, making solar power fully competitive with coal and natural gas. Between now and 2030, the INDCs indicate that renewable-power capacity will grow four times faster than fossil-fuel capacity, with 70% of this new renewables investment in emerging and developing economies. That investment needs to be matched by accelerated progress in battery technology, or by other tools to match electricity demand to intermittent supply. But there is no doubt that, by mid-century, the world can build a cost-effective zero-carbon electricity system. And yet zero-carbon power, though hugely important, is insufficient, because electricity currently accounts for only 20% of global energy consumption. Broader changes to the global energy system are needed. Road transport and aviation, which currently rely almost entirely on liquid fossil fuels, account for 30% of total energy consumption. Decarbonization of these activities will require either electrification or the use of hydrogen or biofuels. This is certainly feasible, but it will take time. Heating buildings is another area where major changes are needed. Here, the more widespread use of zero-carbon electricity, instead of fossil-fuel-based energy, could have a major impact. But there are also important opportunities to design and construct buildings and cities that are substantially more energy-efficient. With the world’s urban population expected to increase by 2.5 billion by 2050, it is vital that we grasp them. Energy use by heavy industry energy, however, presents challenges that are often ignored. Metals, chemicals, cement, and plastics are vital building blocks of the modern economy, and involve processes that cannot be easily electrified. Decarbonization may instead require the application of carbon capture and storage technologies, while newly designed building materials could reduce demand for carbon-intensive inputs. Given these challenges, fossil fuels will undoubtedly play a role in transport and heavy industry for some time to come, even as their role in electricity generation declines. And, even in electricity generation, emerging economies’ INDCs imply significant new investments in coal or gas capacity. Taken together, the INDCs suggest that coal could still account for 35% of global electricity generation in 2030. But that level of coal generation is likely to be incompatible with the below-2°C target. And, because coal- and gas-fired power stations last 50 years or more, such investments raise the risk of either locking in emission levels incompatible with the climate target, or forcing major asset write-offs. The challenge now is to find an economically sensible path that enables emerging economies to fulfill their growing energy needs, while ensuring that the world meets its climate objectives. It is technologically possible. But it will require action by many very different actors. Governments have a vital role to play, but so, too, do incumbent fossil-fuel-based energy companies and new-entrant companies deploying or developing new technologies. NGOs can help to identify required policies and hold governments and companies to account. Individual consumers are also important, because their behavior shapes energy demand. Despite their varied backgrounds, economic interests, and points of view, all of these actors must engage in an informed debate that recognizes all of the complexities of the challenge ahead. The shared objective is clear: to build a low-carbon economy that can keep global temperatures well within 2°C of pre-industrial levels, while delivering prosperity for a world of ten billion people or more.